Ever want to experience the thrill of skydiving but were too afraid of the safety risks? Now there is a new and exciting way to experience the exhilaration of flying, without the worry. iFLY Indoor Skydiving | Tampa offers a unique experience for the adventurous, but slightly cautious person. It makes a great gift idea for people who like to try new things, and is safe for all ages from eight to 80 years old! Every flyer puts on flight gear over their clothes, complete with headgear! This makes for great pictures. All flyers then proceed to the pre-flight training meeting where your instructor will provide a short video of what to expect and tips for a great flying experience. You are then escorted to the flight tube, and this is where it all happens. You begin with some help and hand-holding from your instructor, but soon you get be soaring by yourself. 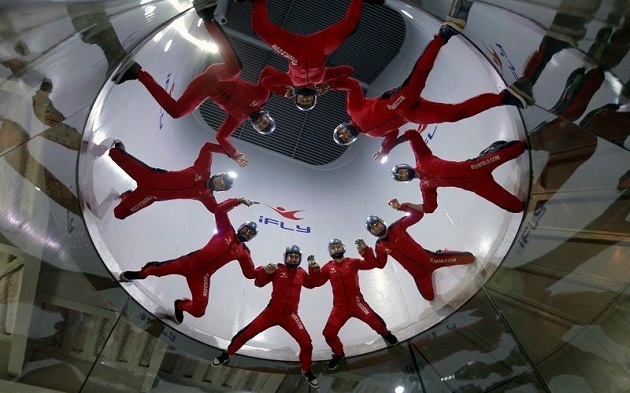 iFLY Indoor Skydiving wants everyone to know this is more than a fun amusement park attraction. This is a real flight simulator that uses the same techniques and training used to teach skydiving. This has also become a sport in itself, with many people becoming highly skilled at indoor skydiving, able to do cool tricks and stunts. You will find that it takes lots of practice to master many of the skills that will have your instructor flying effortlessly, and doing many cool aerial tricks. But not so fast. You will need to learn to let your body relax and learn to master some of the flying techniques they will teach you. And in no time, you too will be in the air. You won’t fly as high or as fast as your instructor, but you will fly, and you will get the thrill of your life if this is something you wish to continue to master, iFLY Indoor Skydiving offers great monthly packages to help you become an advanced flyer. Great gift idea for the person who has everything, great for birthday parties, you can even book a party room and a cool thing to do with a group of friends or family activity in Tampa. It's a fun thing to do in Tampa with out of town guests, and great indoor activity for rainy day fun. Take flight at iFLY Indoor Skydiving and experience soaring to new heights in a safe, controlled environment. It is a thrilling experience just a short drive to Brandon! For more things to do in Tampa, register with us on 813area, we're your free guide to the city!